The Ellcrys held the Forbidding in place. The Ellcrys had a silver-white trunk arched skyward in a symmetrically balanced network of tapered limbs with broad five-cornered leaves that were blood-red. At the base, strips of green moss grew through the cracks and crevices of the smooth-skinned bark. The Ellcrys was a strange and wondrous tree that stood in the centre of the Gardens of Life. The legends told that it served as a protector against an evil that had nearly destroyed the Elves centuries ago, an evil that had been shut away long before the old race of Men. Since that time there had been Chosen to care for the Ellcrys. If the tree weakened, the Forbidding would end and the Demons would be freed. The most sacred of Elven talismans. Stood within the Gardens of Life rooted on a small rise set apart from the other plantings. 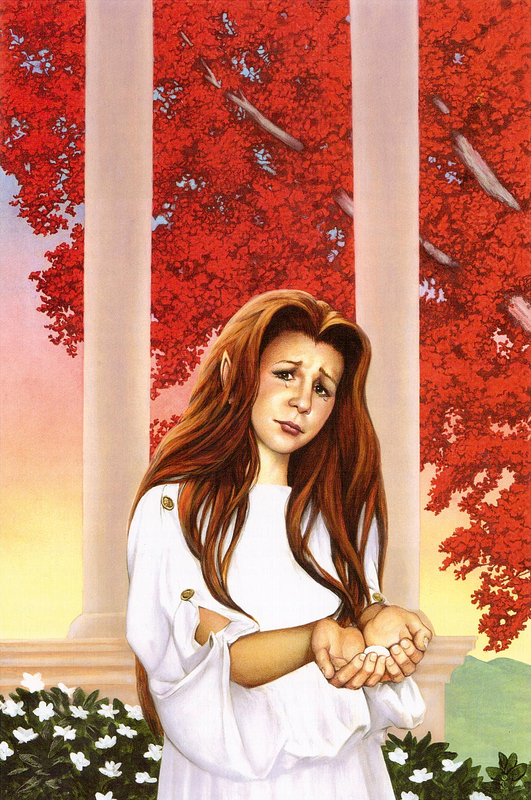 Formerly an Elf, when her life cycle completed and she passed away her successor would come from amongst the Chosen. Long before the birth of the New World, there had been a war between good and evil. The Elves won the war by creating the Ellcrys and banishing the Demons beyond the Forbidding into a timeless dark. As long as the Ellcrys remained strong, the Demons would remain trapped. When Lauren began to greet her, she spoke to him and asked him to gather the remaining Chosen. When they arrived at the tree she told them that she was dying and showed them images of what would happen without the Ellcrys. The Ellcrys spoke to Amberle Elessedil a number of times while she was running the Gauntlet, encouraging her to get up and continue the race.